Located in the south central section of Connecticut, the waterfront town of Old Saybrook is a charming place in which to reside. With a population of roughly 10,000 people, this community is situated approximately 100 miles from both Boston and New York City. 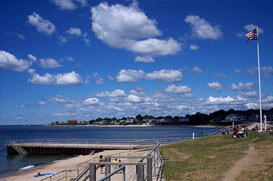 Old Saybrook is a very picturesque town that maintains a small town/beach community atmosphere. Well- maintained roads and clean public spaces are featured throughout the town. Many residents of Connecticut feel that Old Saybrook is one of the nicer communities in the state and generations of state residents have made the town a summer vacation destination spot. Two clean and uncluttered public beaches that are great for swimming and relaxing are located in Old Saybrook. A clean and modern railroad station is located in Old Saybrook. Amtrak rail service to Boston and New York is provided every day and commuter train service is provided during the week by Connecticut DOT. A top-notch public school system is in place in Old Saybrook with one elementary school, one middle school and one high school provided. There are several distinct sections or neighborhoods in Old Saybrook. These include Knollwood, Cornfield Point, Indian Town, Fenwick, Chalker Beach and Old Saybrook Center. Several attractive and well-maintained parks and recreation facilities are positioned throughout Old Saybrook. These include the town green, recreation center, Founders Park, the Saybrook Point Pavilion, Kavanagh Park, Clark Community Park and Mini-Golf at Saybrook Point. The town’s Parks & Recreation department regularly offers an array of activities for residents of all ages. Sports classes and clubs for students are offered as are yoga classes, adult volleyball and adult co-ed softball teams. Summer sport camps, summer teen trips and a family fishing derby are all provided by the parks and recreation department. The Old Saybrook Historical Society is an interesting facility where open archives of the town’s history are stored and educational programs are presented. Perhaps the most famous resident of Old Saybrook was the late actress, Katharine Hepburn. The old town hall building in town has been converted into a theater named after Ms. Hepburn. Other attractions that are located very close to Old Saybrook include the Essex Steam Train & Riverboat which offers short local steam train excursions including special dinner tours, children’s birthday parties and riverboat charters, two casinos and a seaport/aquarium. A wide assortment of retail stores are located in Old Saybrook, CT, especially along Main Street in the quaint and attractive downtown area. Just some of the types of retail shops that are located in Old Saybrook are antiques shops, art galleries, garden centers and florists, book stores, toy stores, baby boutiques, clothing stores, gift shops and more. There are many excellent restaurants in all price ranges located throughout the town of Old Saybrook.